Patrons at a street cafe in the old town of Nice enjoy el fresco dining on a balmy afternoon in the Cote d'Azur, Provence, France. along the Cote d'Azur in Provence, France. 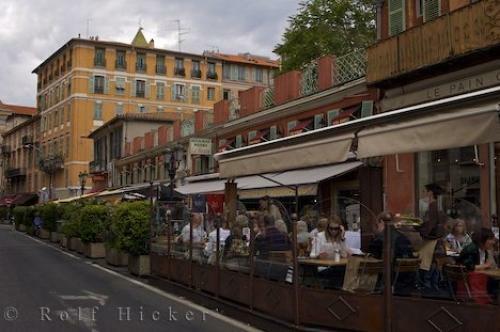 ... this street cafe in the old town of Nice in Provence, France is too busy, venture a little farther down the block and another street cafe will be open for service. Many tourists prefer the old town of Nice over the newer part of the city as the buildings have more history behind them, vendors line the streets, a new attraction is hidden away down the lanes and when the day nears its end, you feel perfectly safe walking the streets while enjoying the nightlife of the Cote d'Azur in Provence, France.Street cafe near the Markets, Cours Saleya in the Old Town of Nice, Provence, Cote d'Azur, France, Europe. I photographed this photo with the digital SLR camera model Canon EOS-1Ds Mark II, aperture of f/5.6, exposure time of 1/250 sec. on ISO 100, as always I used a original Canon Lens, the focus lenght for this picture was 35mm.